The Secretariat of the Pacific Community (SPC) has signed a memorandum of understanding with the International Seabed Authority (ISA) which is currently holding its 21st annual session in Jamaica. The MOU expresses the mutual interests of SPC and ISA in developing regional and national frameworks that support the interests of both organisation’s Pacific member states, and efforts to regulate and manage deep sea mineral activities in ocean areas beyond national jurisdiction; conducting marine scientific research and analysis results; and participating in capacity-building initiatives and sharing seabed resources information. 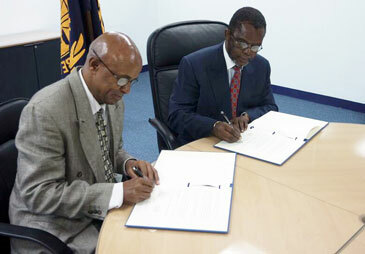 Chief Geoscientist at SPC, Dr Kifle Kahsai, said the MOU will strengthen partnership of the two organisations. “The decision of the Council to approve the proposed MOU between the Authority and the Pacific Community is a vibrant testimony of the remarkable relationship established between the two organizations over the years,” Dr Kahsai said. “The highest level outcome of the partnership between SPC and the Authority will enable the Pacific Community to provide consistent and comprehensive assistance to all Pacific Island States who decide to engage with deep sea mineral activities,” Dr Kahsai added. SPC is one of five organisations granted observer status to the ISA Assembly. Established in 1994 under the United Nations Convention on the Law of the Sea, the International Seabed Authority is responsible for the development and implementation of global rules, regulations and procedures for the exploration and extraction of seabed mineral resources as well as the protection of the seafloor environment beyond the limits of national jurisdiction. Delegations from Cook Islands, Federated States of Micronesia, Fiji, Papua New Guinea, Republic of the Marshall Islands, Tonga, and Tuvalu have been participating in the International Seabed Authority’s 21st annual session (from 14-24 July), with assistance from the SPC-European Union Deep Sea Minerals Project. A side-event was held (20 July) by SPC with the strong participation of the Pacific Delegations attending the annual session of the Authority in order to raise awareness of the progress achieved in the Pacific Island Region with regards to the development of national consultation workshops, national deep sea minerals regulatory frameworks, in-country capacity building initiatives and future activities of the SPC-European Union Deep Sea Minerals Project.